"Park Near Palanga City", by Sergei Nikolaevich Vedeneyev, estimated at $3,000- $4,000. 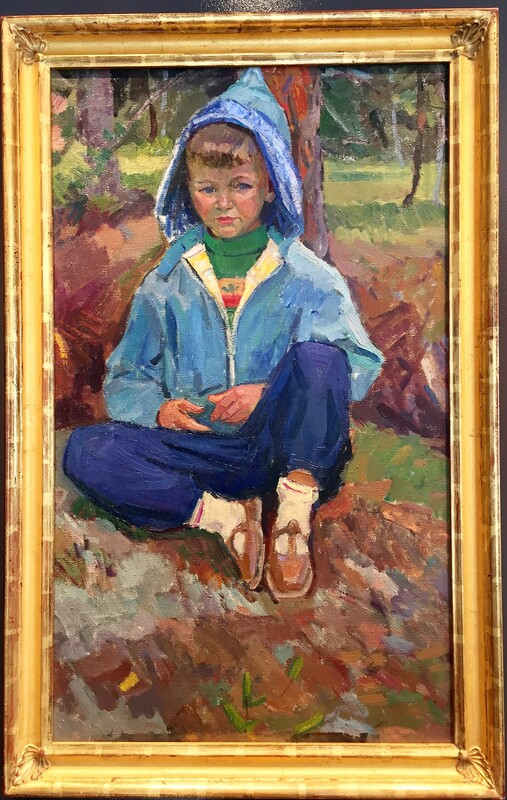 As our January silent auction selection, we are pleased to present a wonderful portrait, "Portrait of the Son", by Piotr Serapionovich Krokholev. Estimated at $6,000- $7,000 the current bid for this large (44" x 28"), Krieger-Rick's 24 carat gold leaf framed painting by a great artist is just $2,000! This is truly a rare opportunity to add a stunning work to your collection. In the Soviet Union there was no commercial art market- no private sales, no galleries, no art dealers. Artist's were employed by the State working through various Artist's Unions. The artists painted according to the officially approved doctrine of Socialist Realism. However, often times they disregarded what was then called the 'social order' and they painted what they wished. Such was the case with Piotr S. Krokholev. His lifetime body of work was very official, following the tenets of Social Realism, but he also painted from his soul and as he wished. 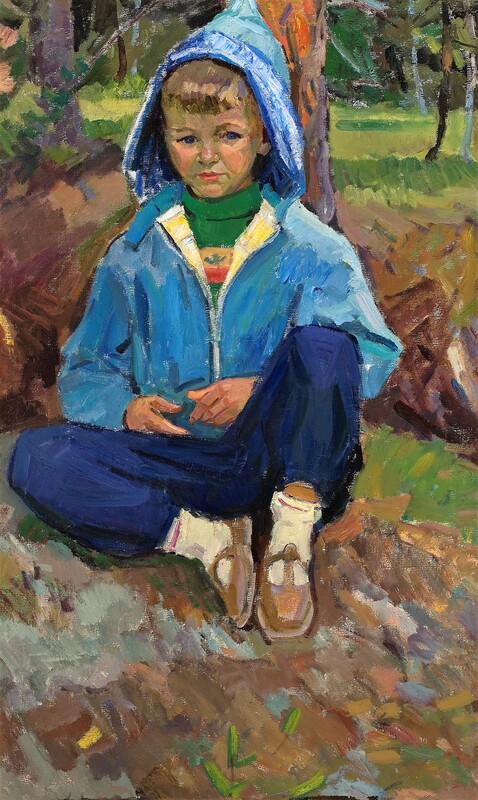 Piotr Serapionovich Krokholev, "Portrait of the Son"
Gallery partner Jim Dabakis remembers his first meeting with Piotr Krokholev in Minsk in the early 1990's. "In his spacious studio, at first he brought out his official works. We then asked to see his works that he had painted for himself. He brought out 10 to 12 fantastic paintings one of which was the painting "Portrait of the Son". I asked about the painting and Piotr Krokholev explained that he had married very late in life due to the war and the devastation and disruption it caused. Because of that he feared that he would never be a father. The portrait was of his son on his 7th birthday and Piotr Krokholev had painted it as a celebration of his son, his family and his life. He had a several very personal paintings of his children, all masterfully painted from his heart. Piotr Krokholev said that the boy was resigned to being a model for his father but always required payment of ice cream after a sitting. In this painting, he caught his son's growing impatience, you can see a glint in his eyes toward the ice cream. We agreed on the two paintings. As we were leaving, Piotr Serapionovich said that his son was now one of the leading cardiologists and medical professors in the USSR." We invite you to participate in this month's auction and thank everyone who placed bids in December's auction. "Portrait of the Son" is estimated at $3,000 to $4,000, the current high bid is just $2,750! The next bid is $3,000, followed by minimum bidding increments of $250. Note: This is a large painting at 44" x 29" framed. Depending on distance shipping/packing could be $200 or more. Free deliver in the Salt Lake area. Bids will be taken via telephone, or e-mail until 7:00 pm MST, Friday, February 1st. Follow all the bidding updates on the Gallery's website. Piotr Krokholev, a Minsk painter, Merited Art Worker of the Byelorussian Republic, was born on October 5, 1919 in the District of Shadrinsk of the Kurgan Region (Russia). In 1933-1937 Krokholev studied at the Pedagogical College in the city of Sverdlovsk where the family moved to. In 1937 he entered the Sverdlovsk Art College and studied there only three years. In 1939 Krokholev was called up to the army. Krokholev was a participant of the Great Patriotic War. On demobilizing, in 1945, Krokholev became a student of the Repin Institute (Leningrad). His teachers at the Institute were V. Oreshnikov, A. Mylnikov, I. Serebrjanny, Y. Neprintsev, B. Fogel. In 1952 he graduated from the Leningrad Repin Institute. The Arrest of T.G. Shevchenko in 1859 was his graduation picture. Krokholev's creative activity is greatly influenced by the traditions of Russian art and such painters as V. Surkilov, Valendtin Serov, Mikhail Vrubel, Ilja Repin, Isaak Levitan, Ivan Shishkin and Titian, El Greco, Van Deik and others. "To paint means for me to portray our Motherland," says Krokholev. Krokholev paints pictures, portraits and landscapes vividly depicting his native land in all its beauty, its history and present-day life. Land and its people are the main theme of P. Krokholev's paintings. His Organization of a Collective Farm in 1929 (1957), Land Collectivization (1967, a triptych), First Commune in Byelorussia (1969), Towards New Life (1972) reproduce very well the sweeping changes in the life of the Byelorussian village under collectivization. Former Marches (1958), Having Seen Off Those Leavings for the Front (1968). Before An Operational Sortie (1974) portray the feats of the people in the Great Patriotic War. A great deal of the artist's pieces are portraits of collective farmers (Portrait of a Collective Farmer , Portrait of a Herdsman , Portrait of a Fishman  and landscapes depicting the beautiful nature of the artist's native land, Early in April , Birch Trees , and Spring Vyacha River ). Instructor of the Byelorussian Institute of Theatrical Art (Minsk), P. Krokholev devotes much time and energy to educate young artists. In 1970 Krokholev was awarded the title of the Merited Art Worker of the Byelorussian SSR. Krokholev was a constant participant of All-Union, Republic and Region exhibitions. He was invited to to participate in several international art exhibitions as well (China, Romania, England, Poland and Japan). scapes. The artist's paintings can be found in museums' and private art collections in Russia and abroad. 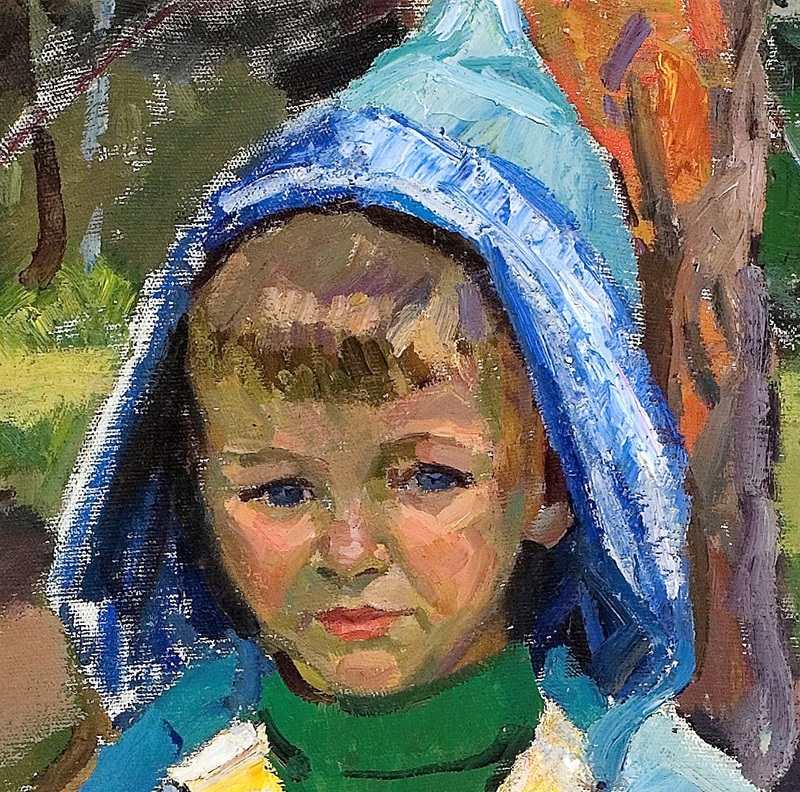 Detail of "Portrait of the Son"
In 1939 he graduated from the Sverdlovsk Art College. In 1952 he graduated from the Institute of Painting, Sculpture and Architecture. Repin. He worked in all genres of easel painting. Since 1956, the Belarusian Union of Artists. Since 1970 - Honored Artist of Belarus. He taught at the Minsk Art School (1953-1956), the Belarusian Polytechnic Institute (1956-61), Belorussian Theatre and Art Institute (1961-1995). Professor (since 1982). P. Kroholeva works are in the National Art Museum of Belarus, Museum of Modern Art in Minsk, the funds of the Belarusian Union of Artists, Mogilev Regional Art Museum. P.Maslennikova. 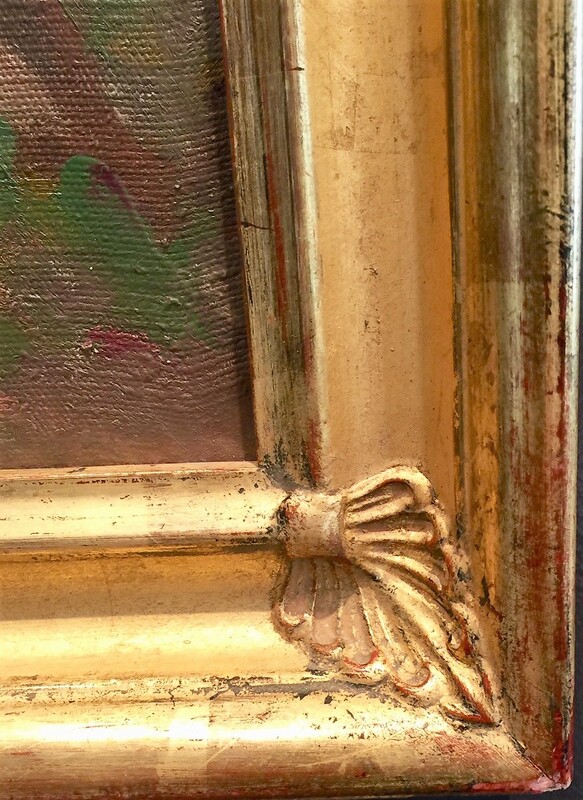 "Portrait of the Son", 25 carat gold leaf Krieger-Ricks Frame, 44" x 28"